Yet another in town trail. In the town of Port Hope I mean. 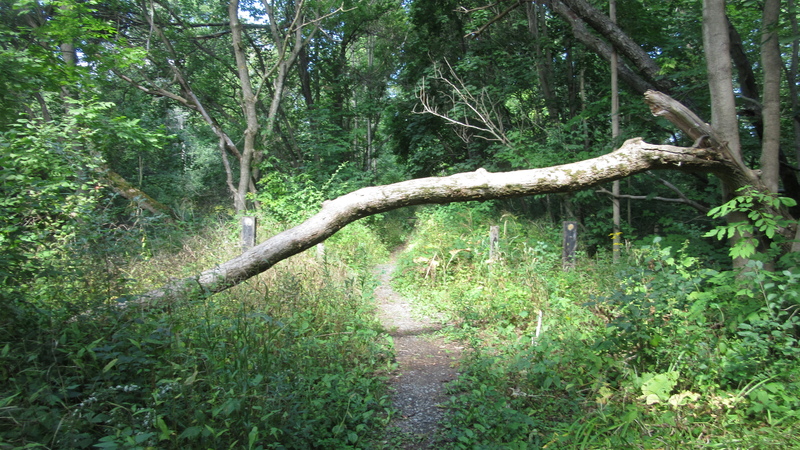 The trail is in the Port Hope Conservation Area and I don’t think it even has a name. This one is right across the Ganaraska river from the Port Hope Millennium Trail and just across the street (Jocelyn) from the Ganaraska River Trail. The well hidden entrance is just North of the 401 (actually within 30 feet of it, just North of the bridge) where Choate Rd takes a sharp turn and becomes Cavan St. It’s an odd little place with lots of parking, for what I’m not entirely sure. There’s not much there but the trail and a patch of elderberry bushes that provide sufficient berries to keep me busy over the Winter. It’s a return trail … which has a raised, parallel section along half its length providing a view of the Ganaraska in the Autumn, Winter, and Spring. The raised section also has a view of the lower trail, so I really can’t call it a “loop”. Both the lower and upper trails are single file walking. 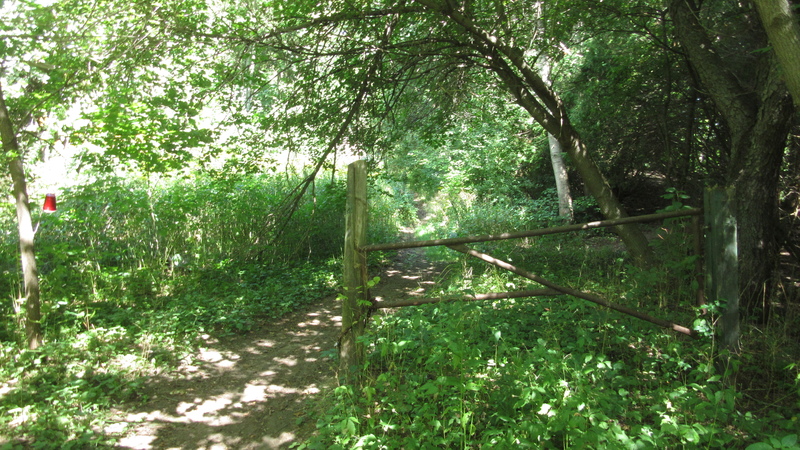 Keep an eye to the right side for a trail wandering off up the slight incline just past the gate. Watch your step up there on that narrow trail. As you will see, there’s ample opportunity to take a long, painful spill down either side. Follow the high trail until it takes a sudden, abrupt turn to the right and starts heading down the hill toward the river. Just before it does that, there will be a trail to the left that will take you back down to the level trail you started on. On that note, there will be numerous side trails that wander East, downhill toward the Ganaraska, all along this trail. They’re fishermen trails leading down to the very edge of the river. Some can be followed in the Spring for a nice view of the Ganaraska. However, at just about any other time of the year, they’re difficult, if not downright dangerous. Continue North (right) on the lower trail which ends at a couple of posts with faded red dots on them and a fallen tree across the trail. You should turn around and walk back at this point, though the trail continues on clearly enough. The problem is that the trail ends here at private property. Due to inconsiderate, senseless, and just plain stupid vandalism to the maple sugar bush and business at the end of that trail, the owner won’t allow anyone to cross his property. The few people who didn’t know to turn back and have run into the owner described him as polite, reasonable, and understanding. But he makes his living off that sugar bush and the vandalism cost him dearly. So, please respect the man’s property. Its not his fault that he had to disallow passage. UPDATE – January 26, 2019 – The owner of the property mentioned above, passed away awhile back. The property was up for sale for quite sometime. I have a suspicion who bought it, but I’m not sure. While it was up for sale, we took the liberty of seeing what the rest of the trail looked like. It carries on through mixed scrubbrush and open areas until it passes under a power line. The strip of land under the lines was typically clear of shrubbery and trees. Search as we did, we couldnt find where the trail continued on the other side. 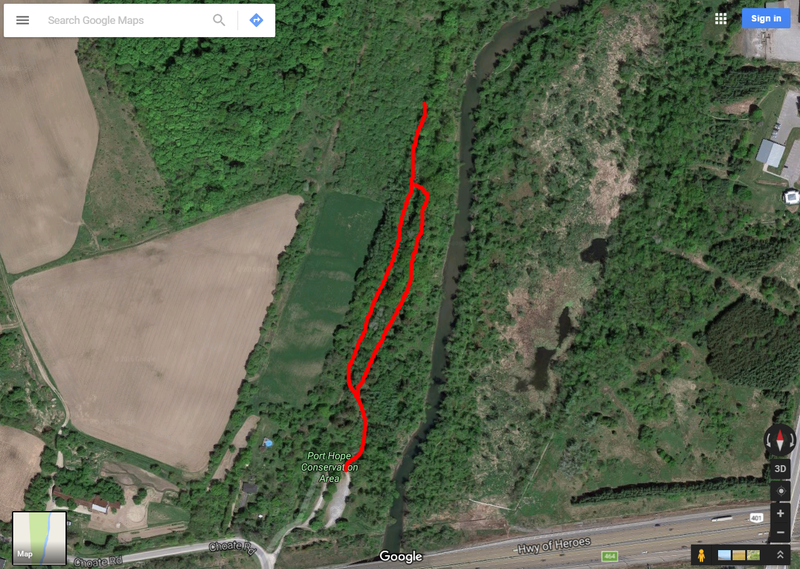 There was a fairly deep ditch to be crossed and we didn’t feel it was worth the bother. 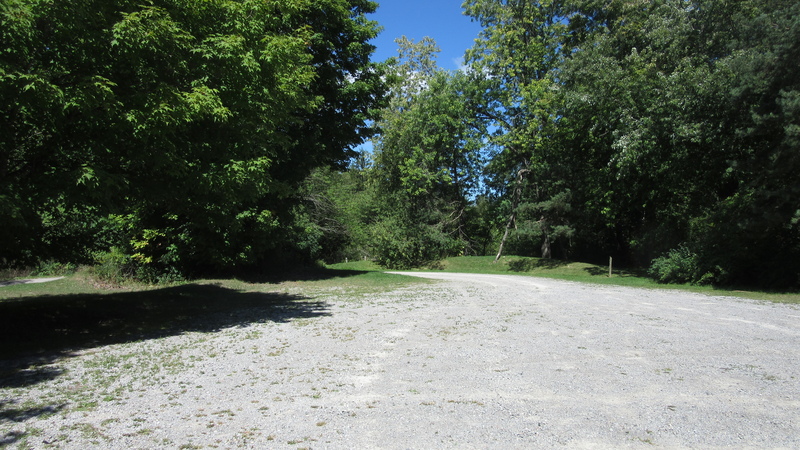 This approximately one kilometer trail in the Port Hope Conservation Area is a level walk, unless you take the high road. Even then, its not a big climb or nuthin’. It is a single file stroll for the most part, and of course, the 401 can be heard for its length. The raised section does provide a nice view of the Ganaraska river from Autumn to Spring. Definitely an “I was in town anyway and had an hour to spare” trail. I certainly wouldn’t suggest a trip to Port Hope to walk it. However, if you’re in town to watch the trout or salmon runs at Corbitt’s dam and fish ladder, this trail is literally just under the 401 bridge to the North away. There are a couple of ways to get to the trail from the parking lot. One is very easy … the rest are very hard. 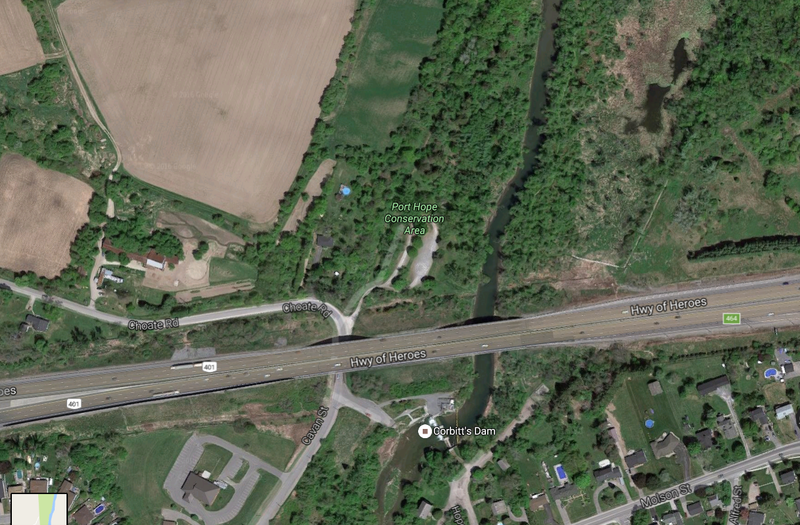 The easy one is to walk North (away from the 401), across the parking lot toward a mown grass area with 3 posts visible. Follow the grassy area North as the bushes close in, guiding you along. This will become the trail right at the gate where the upper trail begins. It used to be a maintained conservation area. There was a large are of cut grass and you used to be able to drive in to a second area. That must’ve been a long time ago Don ? I’ve been walking this trail for near 25 years and have sadly seen it decay into an uncared for patch of brush.